This beautiful long beach overlooks the Bay of Livadi, and is one of the most recent areas of Mykonos to be developed with hotel and bungalow accommodation. The region is a farming area, and the level of development is yet small, thereby ensuring a good level of quiet, relaxation, great swimming, and excellent views. Public bus connects the area of Mykonos Town, ten kilometers away. Situated at Kalo Livadi, one of the most beautiful of Mykonos' many beautiful beaches, this outstanding, intimate accommodation offers 30 elegant rooms and suites, each offering an amazing sea view. Best suited to a mature lifestyle and refined taste, this authentic Mykonian villa offers guests marvelous moments of relaxation and pure inspiration. 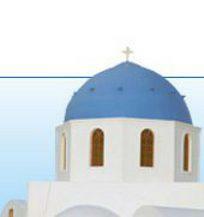 A privileged vacation in an atmosphere of quality, tranquility and charm. 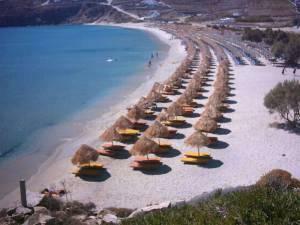 Mykonos Kalo Livadi Beach: footsteps in the sand and umbrellas. Mykonos Kalo Livadi Beach: when the shadows become longer. Mykonos Kalo Livadi Beach: in quest for some shade.